Kickboxing: Learn to Hit Like a Girl | Fit Girl. Happy Girl. Over the past few years women’s interest in kickboxing has been steadily increasing and they are getting hooked on the one-two punch of the high intensity cross-fit cardio workout. The decision to debut women’s boxing in the 2012 Olympics this summer also reflects the growing interest in the sport, leading more and more gyms to host cardio kickboxing classes. Cardio kickboxing classes are typically one-hour long and provide a dynamic exercise that includes both cardio and resistance training. If you’re a runner this workout is ideal to not only improve your stamina and endurance but to build long, sleek muscles that will help you feel stronger during your run and push your hardest come race day. Kickboxing provides you with a complete, all-over body workout. Because it doesn’t just target specific areas, it allows you to strengthen, tone and reduce fat all over at the same time. It also helps to increase flexibility and especially reflexes. Self-defense is another added benefit of taking a cardio kickboxing class. During an average kickboxing class, the instructor teaches you different kicks (round-house, side kick, back kick, etc. ), punches (jabs, hooks, uppers, ribs, etc.) and how to learn to keep your guard up and to bob and weave. While not all cardio kickboxing classes use punching bags, the instructor will help you learn how to gauge the distance of your target and how to through a proper punch, all while remembering to keep your guard up and protect yourself. 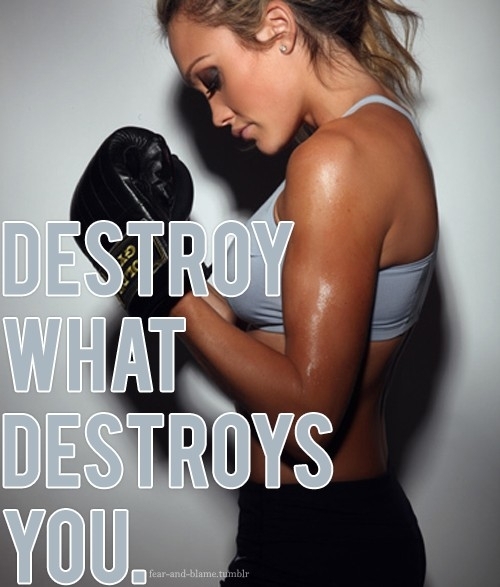 More than anything, kickboxing also helps you to build confidence and self-esteem. For me, taking kickboxing classes is a stress reliever and it helps me to know that I can take care of myself and nothing is too hard to overcome. When I walked into my first kickboxing class I didn’t know if I was going to be able to make it out alive! But as I continued to take class (I now go three or four times a week) my endurance started to build and I realized that I was strong enough to make it through the class. And for some reason, the reaction I get from people when I tell them I do kickboxing is too good to ever give up, so keep your guard up and learn to hit like a girl!